In the end, the pressure of going home proved too much for Abdul Wahab. 26 days after touching down in Dhaka, he died. His wife says he had heart problems. Wahab had been stressed out and depressed. Unable to deal with the loansharks who hounded him constantly. He withdrew into himself. Lost weight. And it seems, eventually, lost hope. His story sounds ever so familiar. He had sold land and gold and took on debt in order to pay an agent S$9,000 to find him a job in Singapore. He had arrived and discovered that there wasn’t any work for him. He was repatriated some four months later with just S$300. No wonder his heart gave out on him. 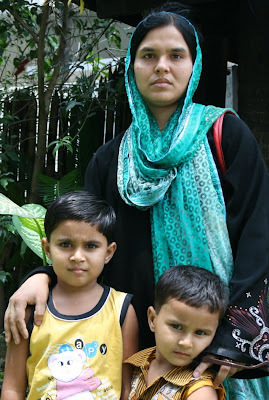 We meet Wahab’s wife, Nasrin one humid afternoon. She visits, along with her two little girls, brother-in-law, a family friend and a stack of old photos. Pictures of Wahab, smiling at their wedding. Posing with their kids. At his sister’s wedding. Wahab in happier times. We hand her a small donation from the Managing Editor of TOC. This money is from the journalist who interviewed Wahab before he left Singapore. She nods. Smiles vaguely. Looks away. There is an awkward pause. Her kids seem oblivious. They have a ball exploring the dining room at our guesthouse. They are tiny. Just three and five. For a moment, Nasrin looks like she might cry. Doesn’t. “Thank-you,” she says instead. And then she is gone. Previous postBoreak, All Grown Up Next postWould You Accept A Job With No Annual Leave?